This material is also available in 35 3/4" x 144" sections. Please call to arrange a freight line delivery, ask about quantity discounts, custom torch cutting available. All material in this category have a +1/4" / -1/4" cut tolerance and will be cut with a torch. 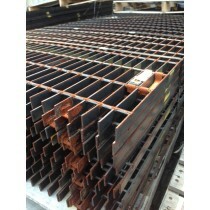 Steel Bar Grating 19-W-4 1" X 1/8" -- 35 3/4" X 12"
Steel Bar Grating 19-W-4 1" X 1/8" -- 35 3/4" X 24"
Steel Bar Grating 19-W-4 1" X 1/8" -- 35 3/4" X 36"
Steel Bar Grating 19-W-4 1" X 1/8" -- 35 3/4" X 48"
Aluminum Diamond Plate Channel 2" X 1" X .045" X 90"
Aluminum Flat Bar 6061-T6511 - 1/2" X 2" X 48"